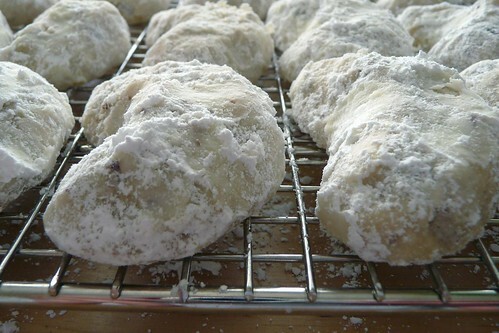 I’ve seen them called Mexican Wedding Cookies and Italian Wedding Cookies. Honestly, I don’t really know how “traditional” these little cookies are, but I do know they came out quite well. It’s an easy, basic recipe, but as with many recipes calling for only a few ingredients, the quality of the ingredients you use will stand out. Using powdered or confectioners’ sugar always reminds me of this night in Liepāja. I wanted to use powdered sugar to sift over some cookies, but it’s not available there. My husband asked me to explain what is is: fluffy, extremely finely ground sugar, often mixed with a bit of cornstarch (to prevent caking), then suggested running some sugar through his coffee grinder. Et voila! Powdered sugar! As fine as I could want and as much as I needed. So if you don’t have some in the cupboard, don’t despair. Just pulverize some regular sugar in a coffee grinder and enjoy. Cream butter and 1/2 cup sugar together until smooth and fluffy. Add vanilla and begin adding the flour gradually. Once flour is fully incorporated, add toasted pecan bits on the lowest speed of your mixer or use a spatula. The dough should be very stiff and not very sticky. Begin preheating oven to 275F. Chill for 30 minutes. Shape about a tablespoon’s worth of dough into a crescent moon shape and place onto a lined cookie sheet. These don’t spread very much, so they can be placed about one inch apart. Bake for 40 minutes. Remove to a rack and as soon as they are cool enough to handle, roll them around in the remaining cup of confectioners’ sugar. Alternatively, put the sugar into a baggie and toss the cookies in. Fast and easy! Replace them on the racks and continue to cool. Store in an airtight container or freeze. I made these for my step-brother’s wedding. They were the most popular dessert item! The original recipe I used didn’t have any salt whatsoever in it. It tasted flat to me, so I added a scant teaspoon of kosher salt, which perked it up. To toast nuts quickly, place a handful into a small microwave-safe bowl and zap em for about 2 – 3 minutes total, stirring and checking every 30 – 45 seconds. Toasted nuts will darken a bit and smell lovely, so it’s easy to know they’re done. This entry was posted in cookies, dairy-free, Dessert, recipes, untranslated. Bookmark the permalink.